Cheri Romanoski – petite, always charming, and incredibly inventive – is the reigning queen of prickly pear in Southern Arizona. Back in the early 1980s, she began preserving fruit such as prickly pear and the citrus that grew near her Tucson home. By 1985, she had rented a small facility and began her business, Cheri’s Desert Harvest. 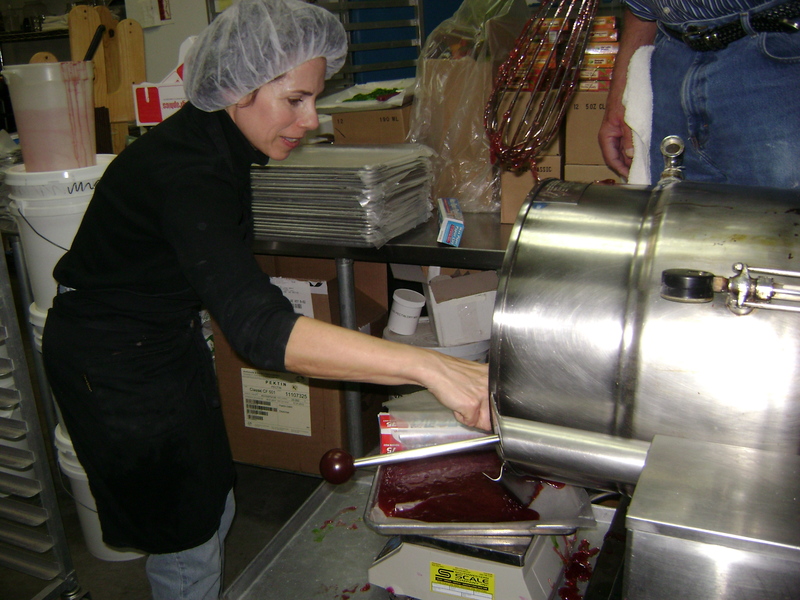 Cheri makes a range of delicious jams, candies and jellies, but what she is most known for is her prickly pear jelly, syrup and candy. Every fall, Cheri’s staff harvests 70,000 pounds of the deep magenta Englemann prickly pears. Of course she can’t process all that right away, so the harvest is frozen and cooked throughout the year. Then it is shipped throughout the country to gift shops, grocery stores and top-end restaurants. Famous chef Bobby Flay uses Cheri’s prickly pear syrup in margaritas at this Burger Palace and Mesa Grill. Customers who can’t buy her products locally can order off of her Cheris Desert Harvest website. Preheat oven to 400 (375 for convection oven). Sift flour, sugar, baking powder and salt together and set aside. Mix oil, egg and milk and add to dry ingredients. Stir until moistened. Batter will be lumpy. Fill greased muffin tins half full. 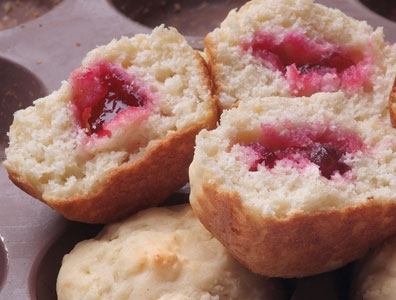 Place 1 teaspoon of jelly in the exact center of each muffin, with jelly not touching edges. Add remaining batter, covering jelly, so the tins are two-thirds full. Bake for 20 – 25 minutes or until golden brown. Do you have a favorite use for prickly pear syrup or jelly? Do share in the comments section. I bought your Prickly Pear Cactus Candy. The whole family agrees that we cannot taste any prickly pear because the added lemon flavor dominates. It is basically Lemon jelly colored with cactus fruit. I actually don’t make the candy; I was just writing about a product made by someone else. It’s easy to make yourself with prickly pear syrup and a recipe for this kind of candy you can easily find on the Web. I hear you can BUY prickly pear vodka. Why? Just toss some good prickly pear in with any old vodka and voila? Same with margaritas. Can’t beat it. Or ice cream?